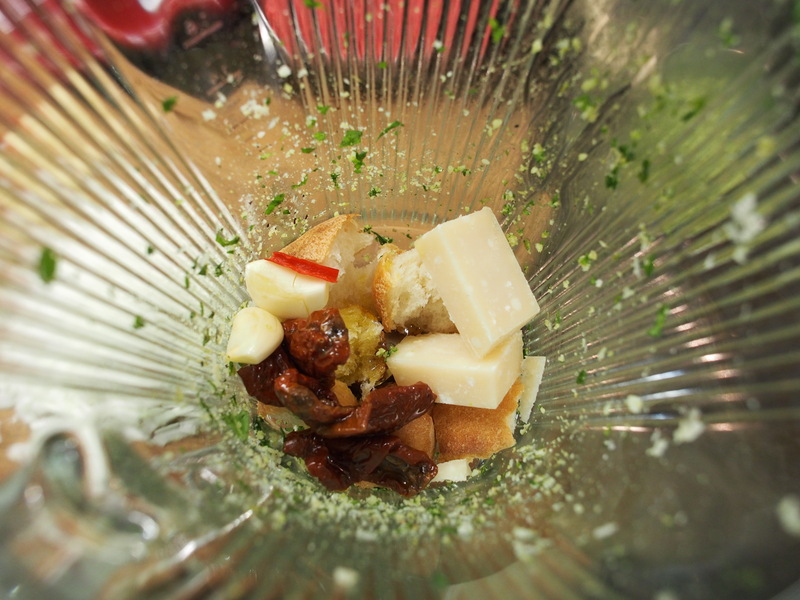 Even though my blender is designed to mainly liquify ingredients, I am still inspired to maximize it’s usage. 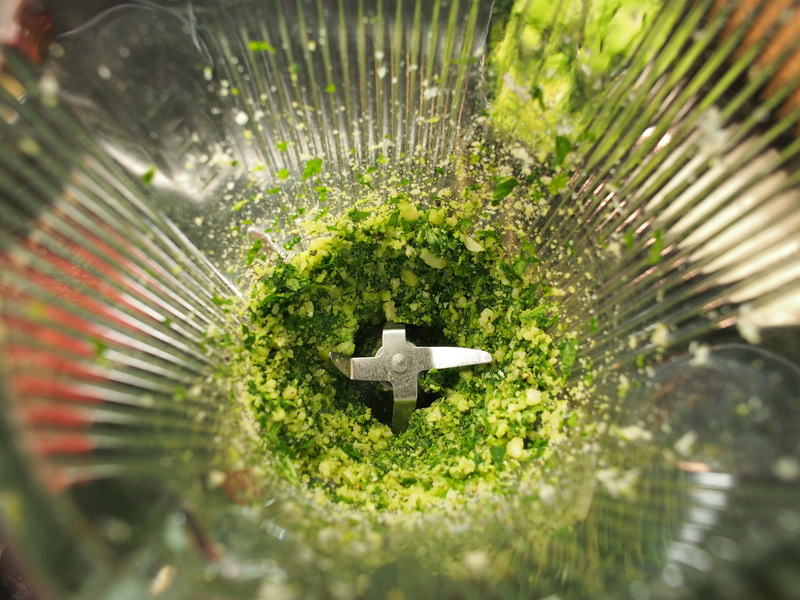 In this recipe, I used my blender to make this beautiful crispy golden crust and the spicy pesto sauce. 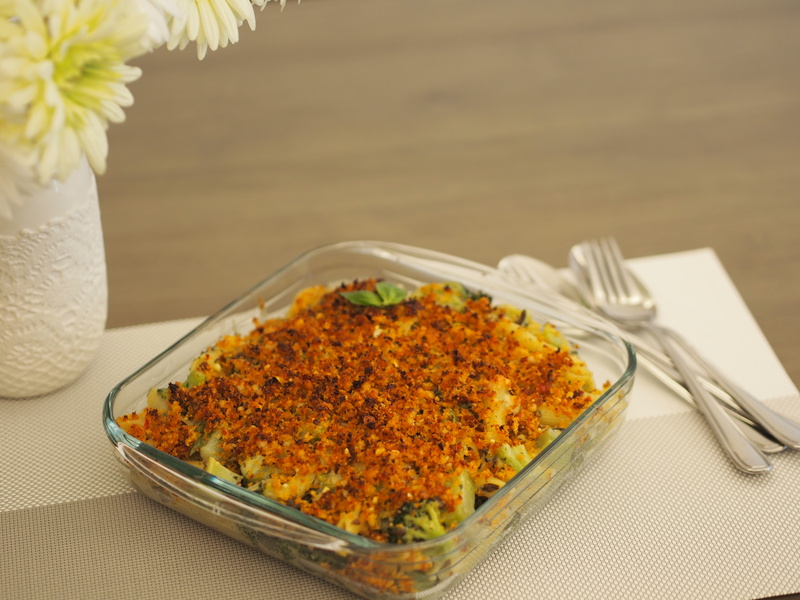 My inspiration for this dish came from a broccoli/pea mashed potato and a ‘fish and chips’ baked cod that Jamie made. 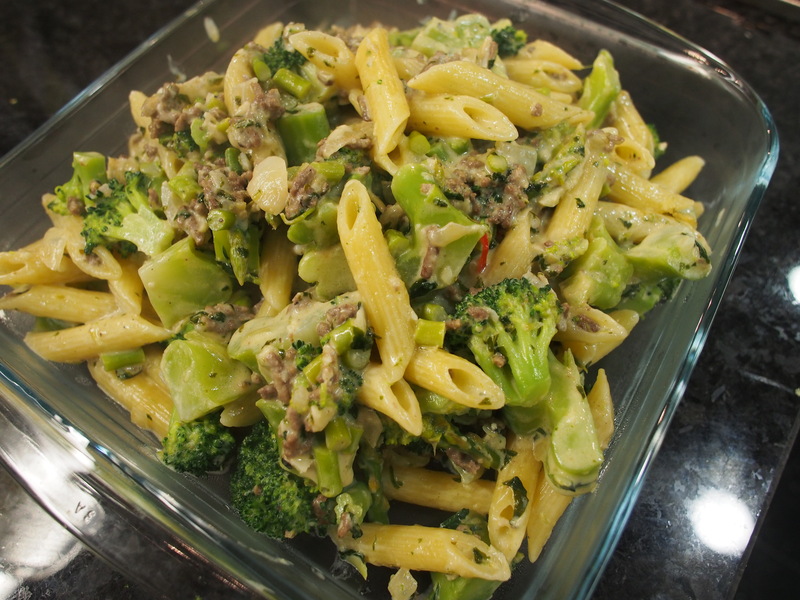 Broccoli is my favorite veggie, I love its texture, flavour, it’s cute florets, and I love the idea of mashing it up into the pasta sauce to deliciously incorporate into a meal. 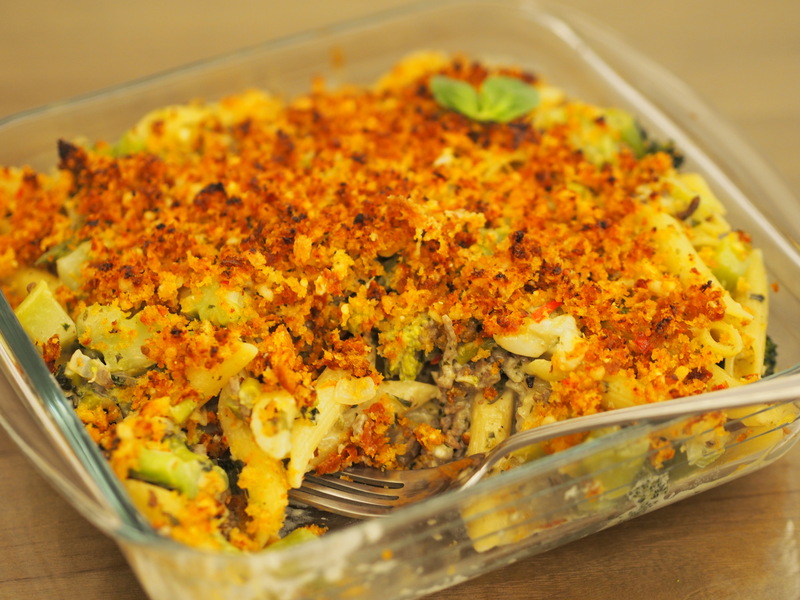 I also love the fanciness the spicy breadcrumbs add to the topping, so I wanted to incorporate both into this crispy baked pasta dish. So that’s my inspiration for this dish, I hope you enjoy! 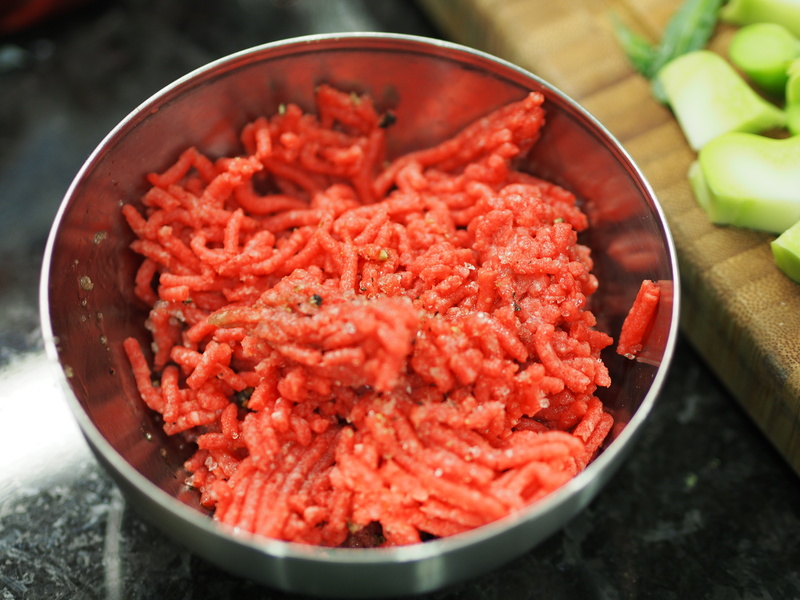 Half pack minced beef (approx. 140 g). 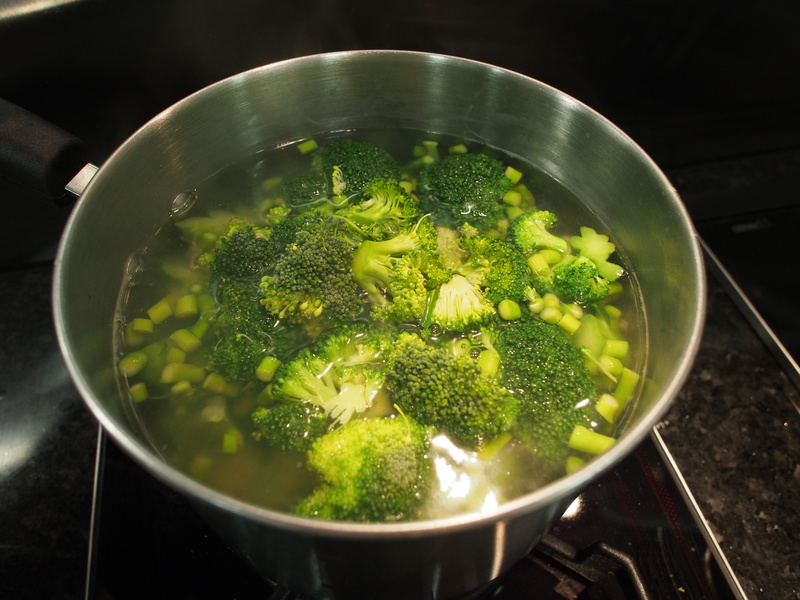 I am separating the two parts of the broccoli because they require different cooking times. 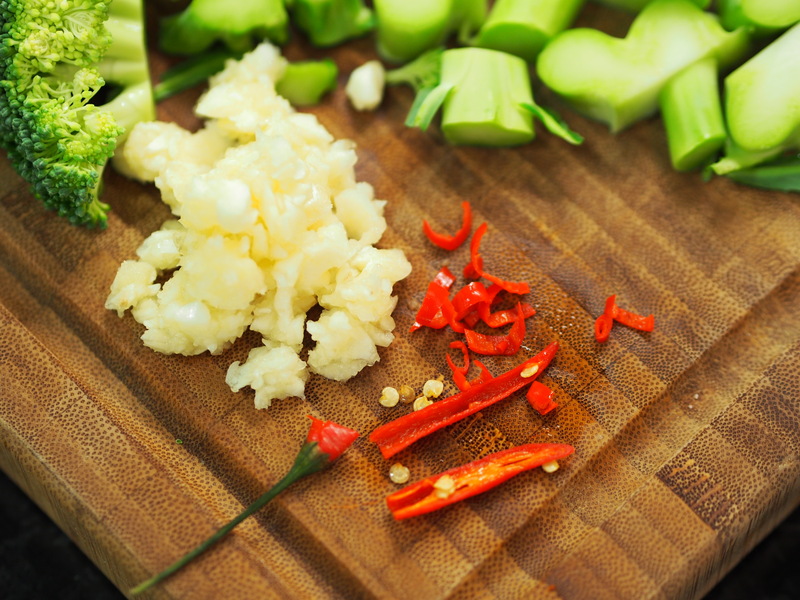 The delicate flowery head cooks in a much shorter time than the thick stem, so to prevent overcooking them and to keep that beautiful green color, I will be cooking the stem first. 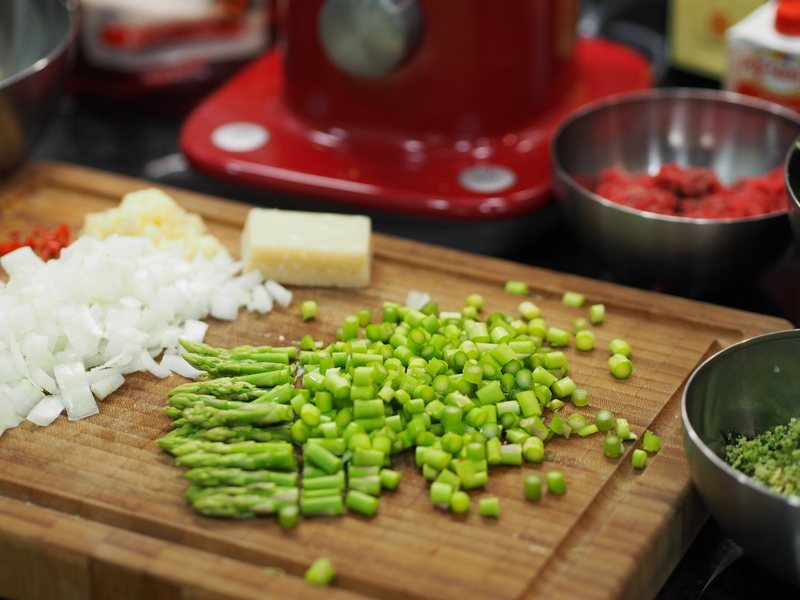 Keep them separate so that you can cook the thick stem first. 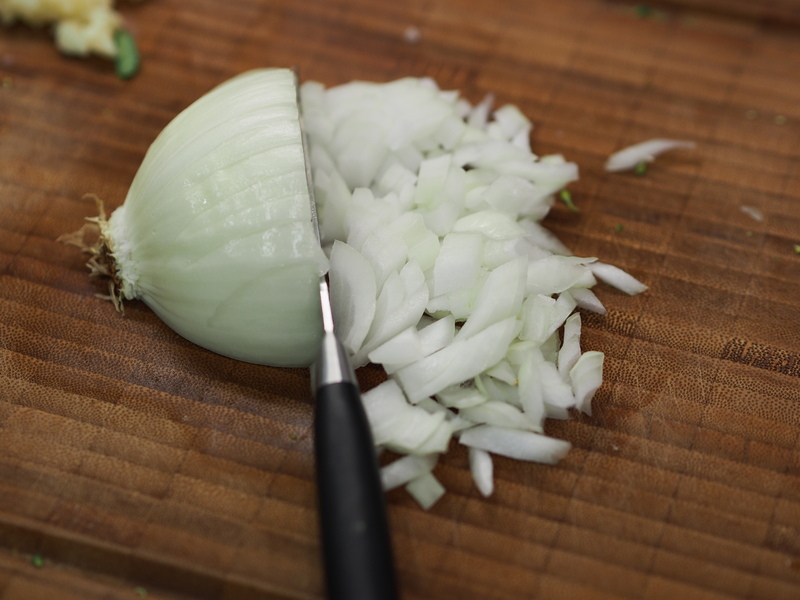 Here’s a quick trick for dicing onions! 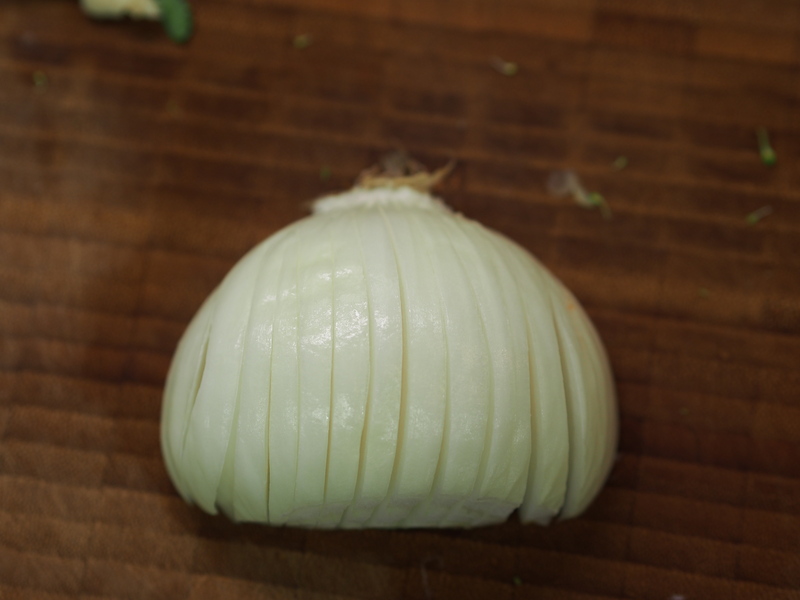 Then, thinly slice the onion horizontally across the cuts you just made. 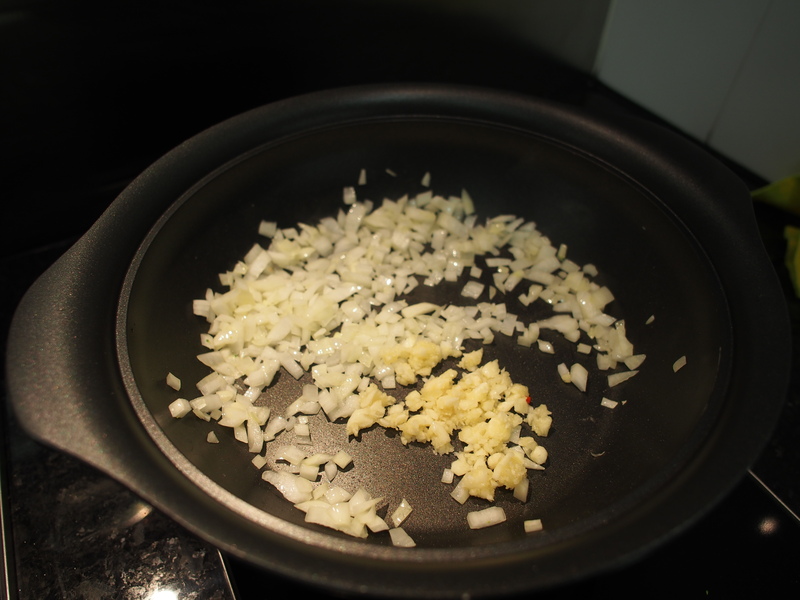 Very quickly, you’ve got equal sized diced onions! The seeds and white web-like parts holding the seeds in the centre of the chili are the spiciest part of the chili. 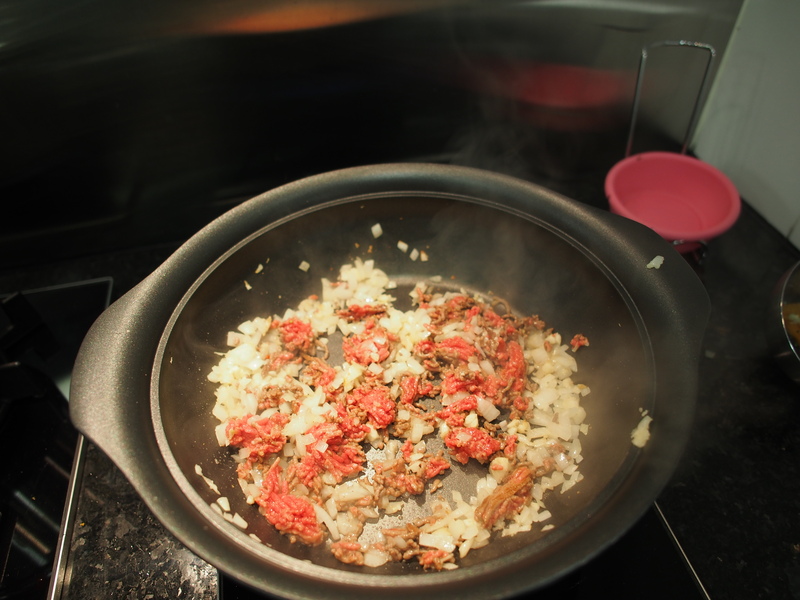 So depending on how much heat you can take, keep or remove them as desired before slicing the chili up. 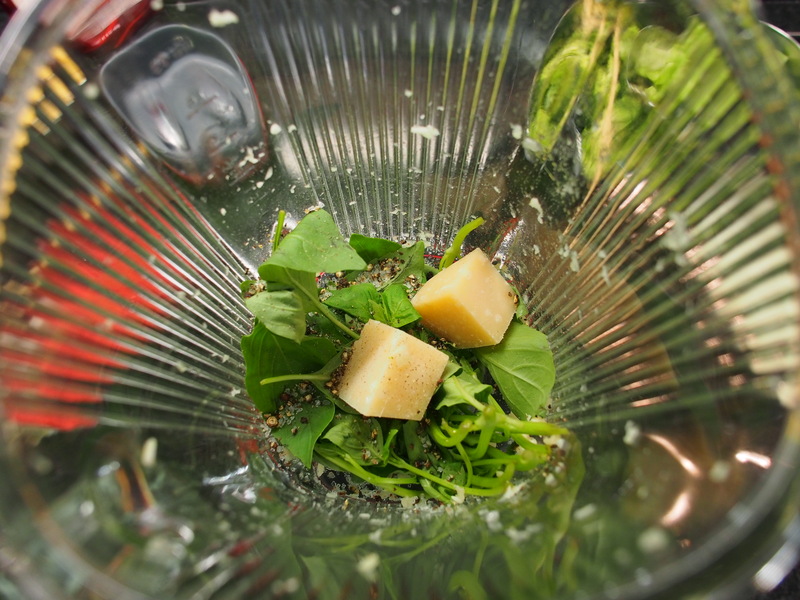 In the blender, add the basil leaves (I’ve removed the stems because they are quite hard to chop up in the blender without adding a lot of oil), parmesan, salt, pepper. 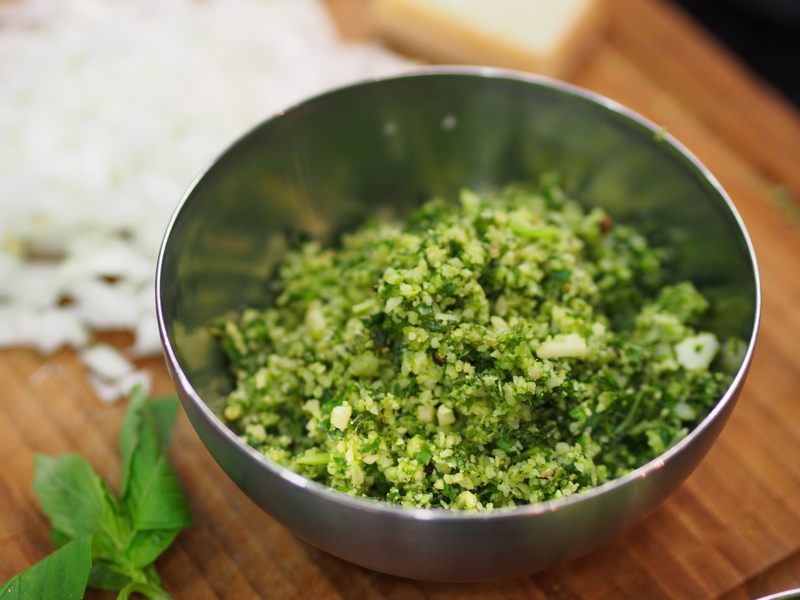 You can add pine nuts, pistachios, or some of the broccoli stem too! 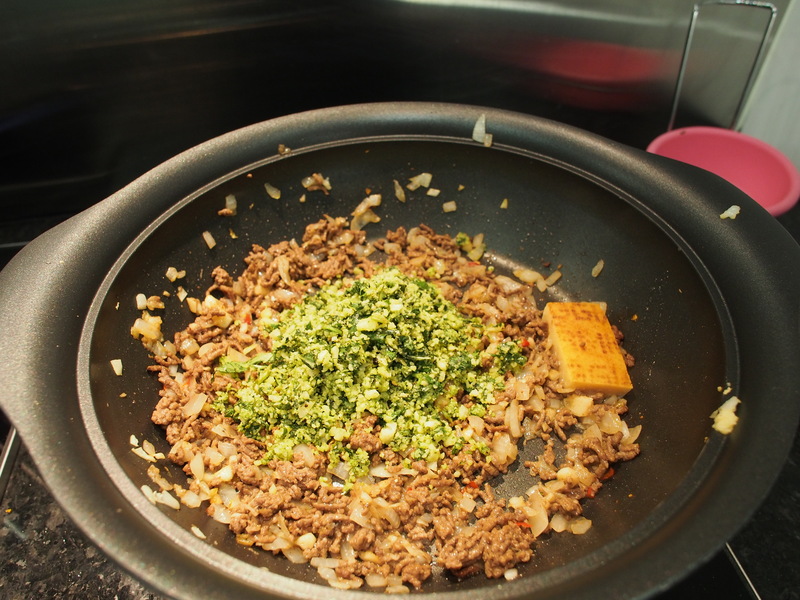 If you don’t have a blender, just roll up the basil like a cigarette and mince with your knife and use a grater for the cheese. 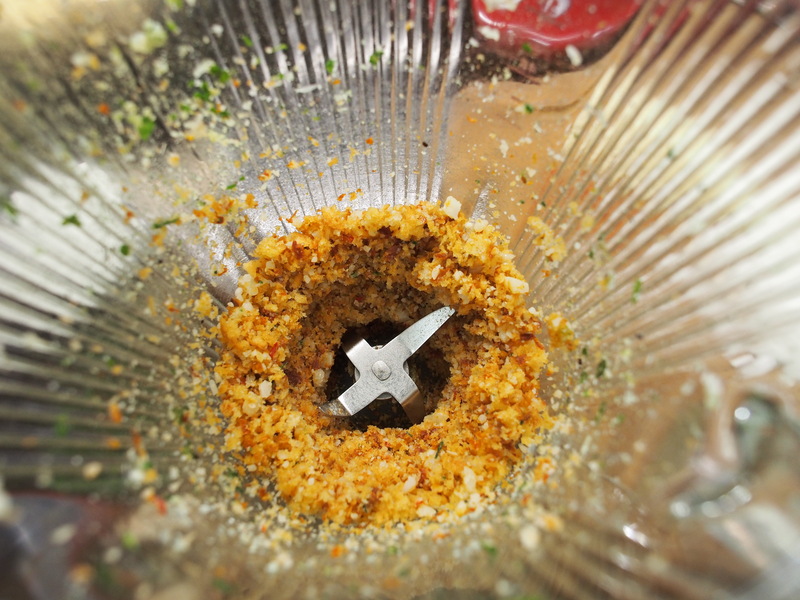 Without washing the blender, just add the baguette, parmesan, sundried tomatoes, and some of the sundried tomatos’ oil (the oil will help the caramelization of the bread crumbs, making it crispy and pigmented). When you open this lid, be prepared to be blown away by how amazing this blend smells! The sundried tomatos really give it an extra punch in flavour and aroma! I wanted to just eat it right out of the tub! 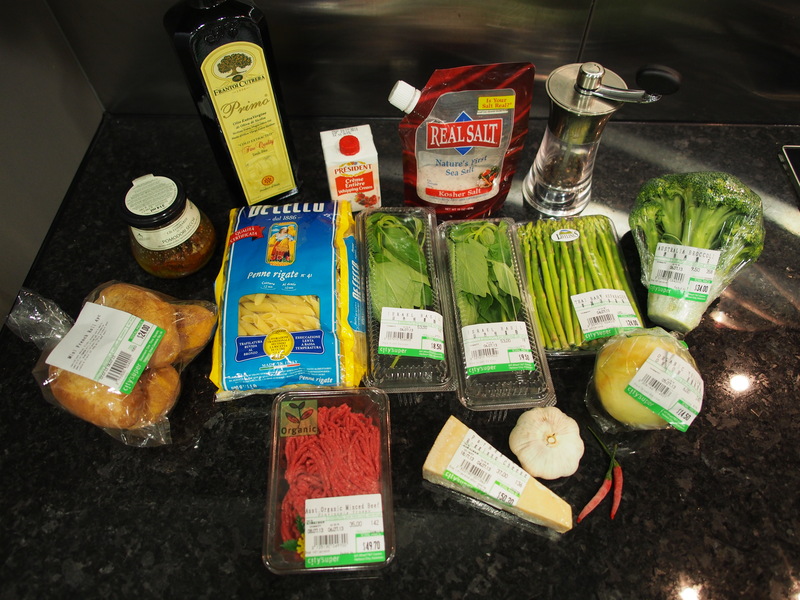 Here are all the ingredients prepared! 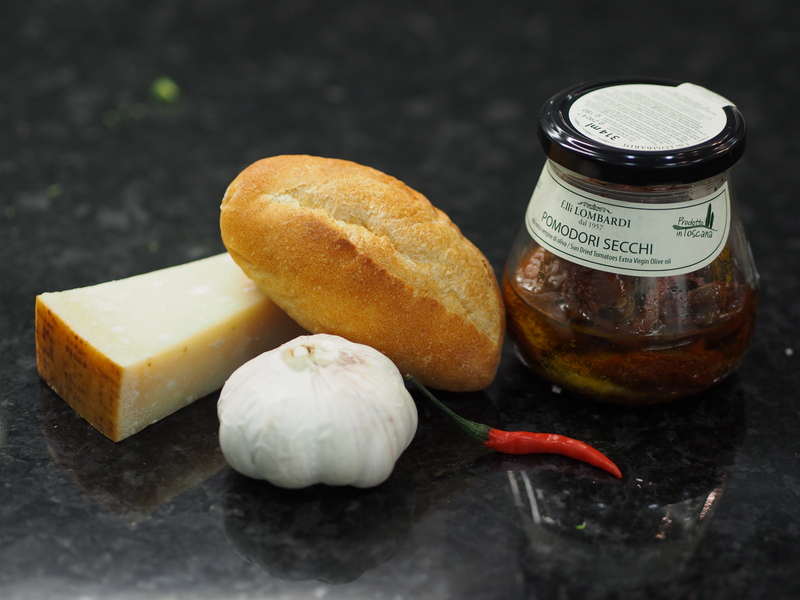 *Don’t throw out the rind (dry shell) of the parmesan, we will use it later! I’m only cooking the pasta to about 60-70% done before transferring it to continue cooking in the sauce so that they can really absorb the flavours of the sauce without overcooking. 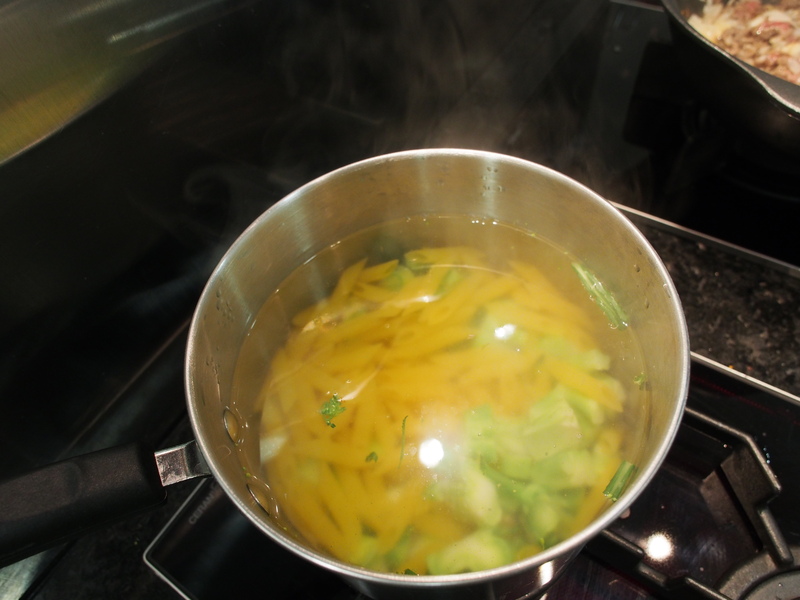 It’s really not attractive when veggies become yellow from overcooking, so I didn’t cook pasta and veggies too early. 12. 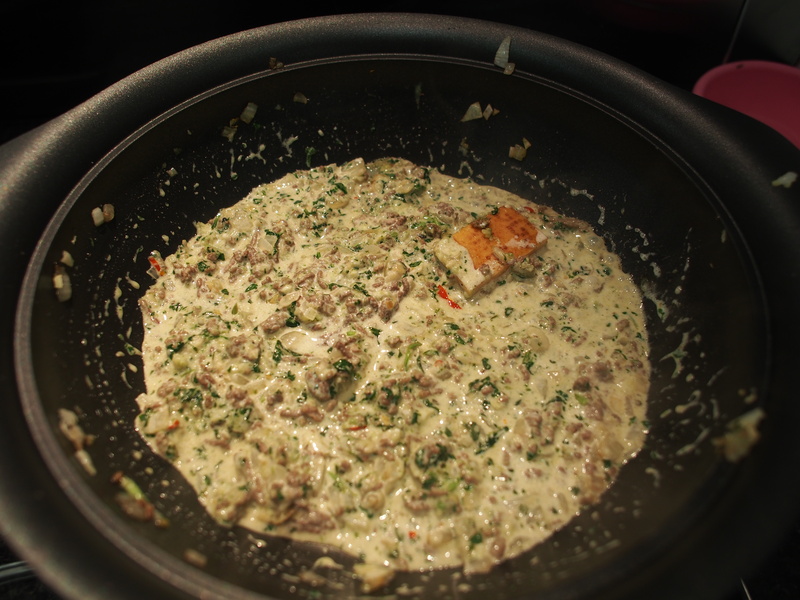 Add the parmesan rind and basil/cheese blend to the beef mix. 13. Add 100-200 ml of cream depending on how creamy you like it. 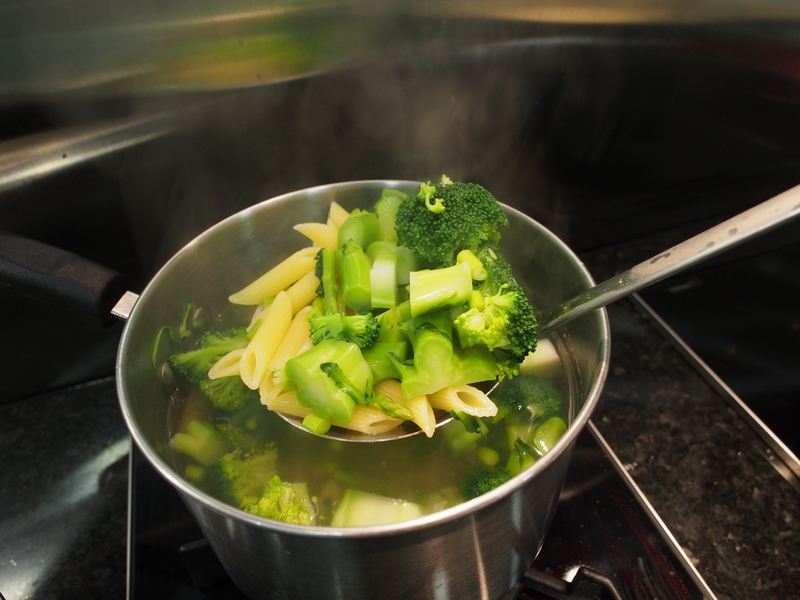 If you want it to be less creamy, add less cream and use more of the pasta water to cook the pasta through later on. 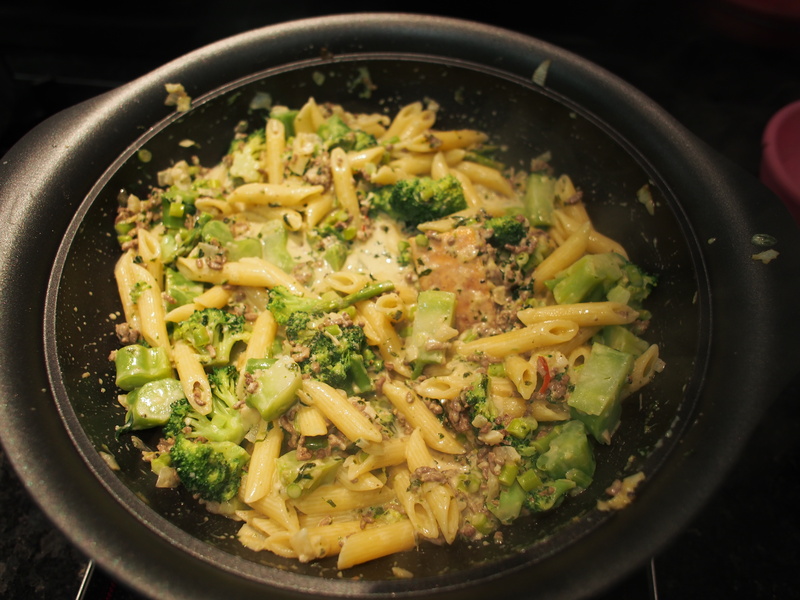 If you want to skip the cream completely and make it a olive oil based sauce, you can add more extra virgin olive oil and use more of the pasta water to cook the pasta with the sauce later on. Your imagination is your limit! *at this point, the penne should be only 70-80% cooked through, there should still be a thin white line on the inside. 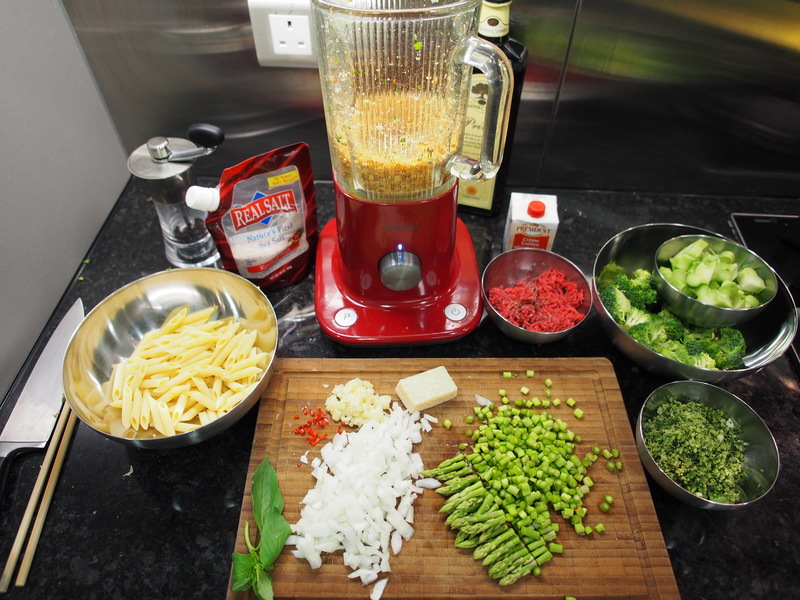 Cook the pasta and sauce together for 1-2 minutes, adding a little of the pasta water as the sauce gets absorbed by the penne. 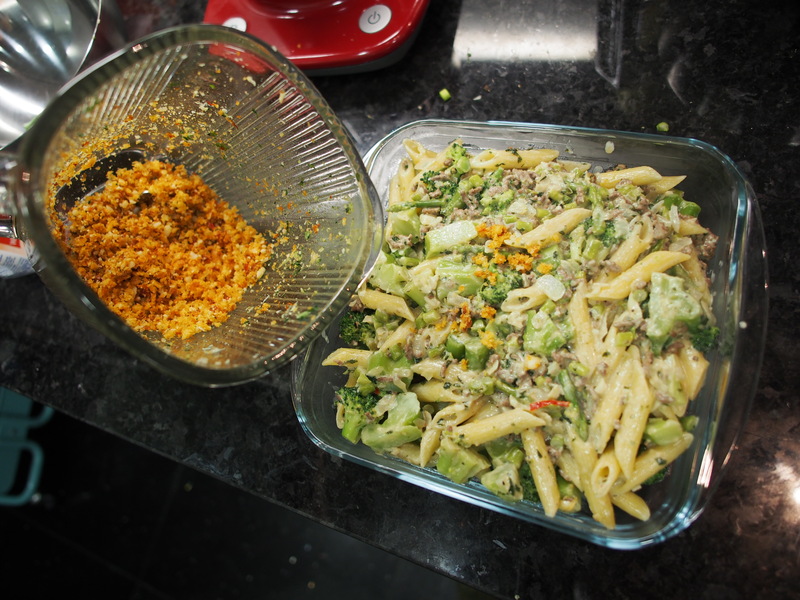 Taste test and see if you want to add more salt, chilli, pepper, pasta water or cream! 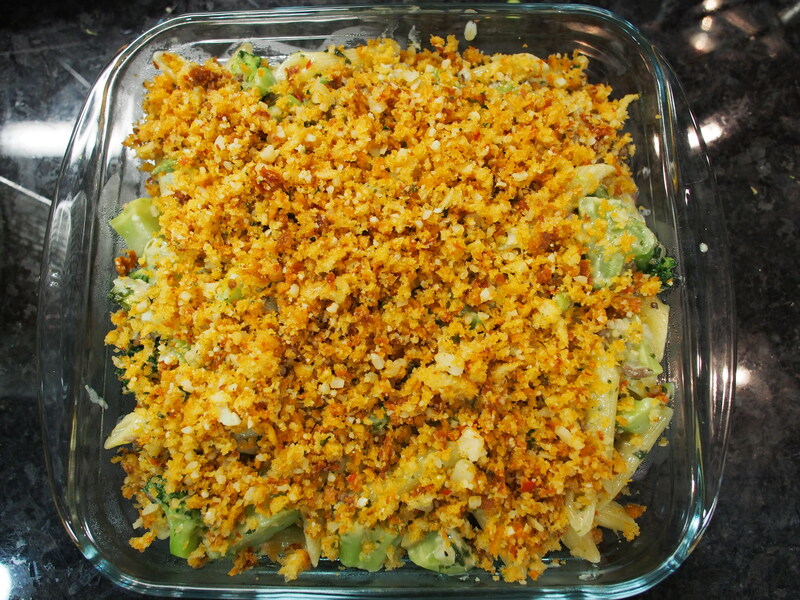 If you want to skip the crispy topping, this is a great pasta just like this! *I just realized this would make a great topping for mac & cheese! 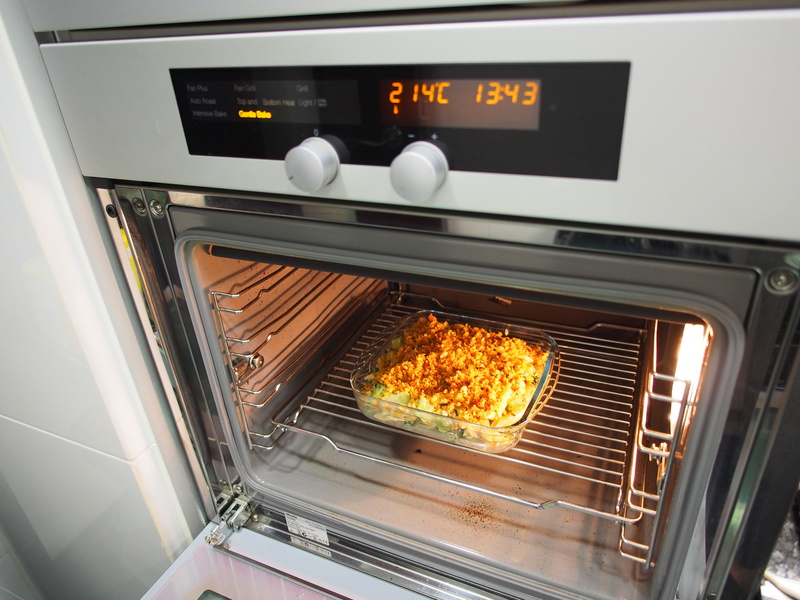 And it’s ready! Decorate with basil leaves if you desire. The top is crispy and crumbly and the sundried tomatos and chilli really give it an extra kick of flavour. 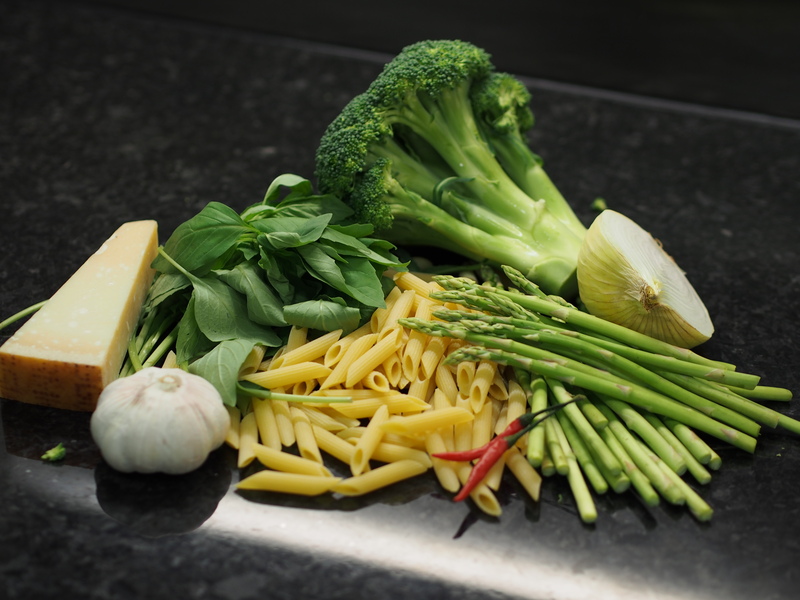 We don’t usually eat a lot of veggies in our pastas, but in this dish you wouldn’t even notice you’re eating so much! 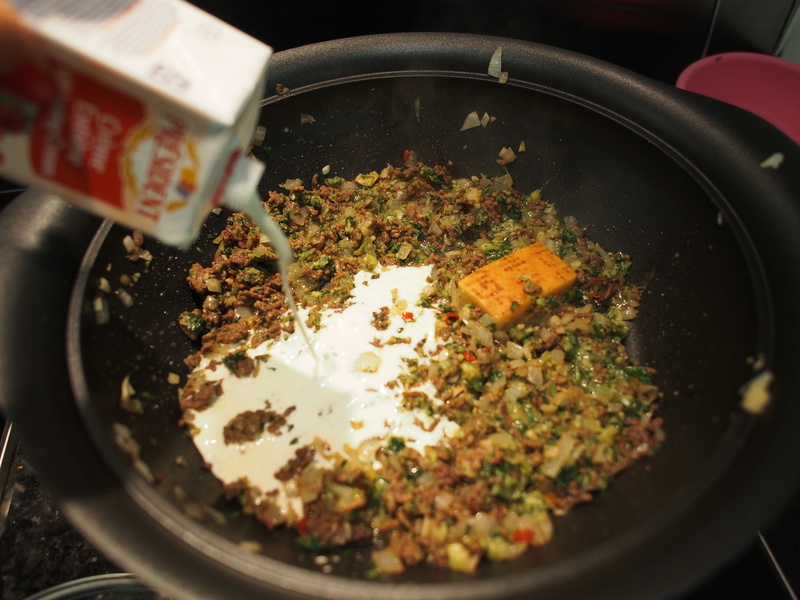 Also, you can really alter the taste to your liking, making it more or less creamy/spicy/crunchy. And I promise it’s not as ‘oozy creamy’ as you would imagine, the broccoli and chilli really balance out the creaminess. 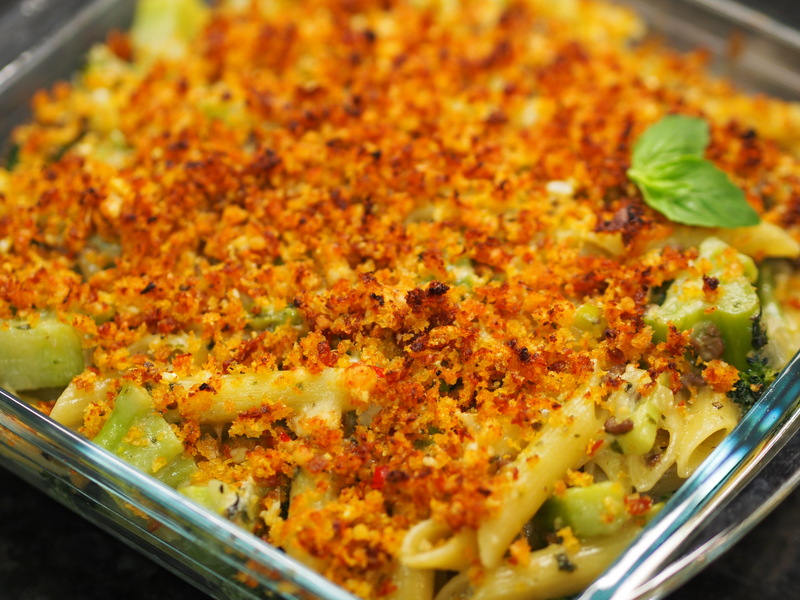 This is a great dish to bring to a pot luck because it’s got everything in one- pasta, meat, veggies, and a display of your skill with the beautiful crumbly crust! I hope you enjoy, if you ever make this, please let me know and share a picture with me! Love Jaime! 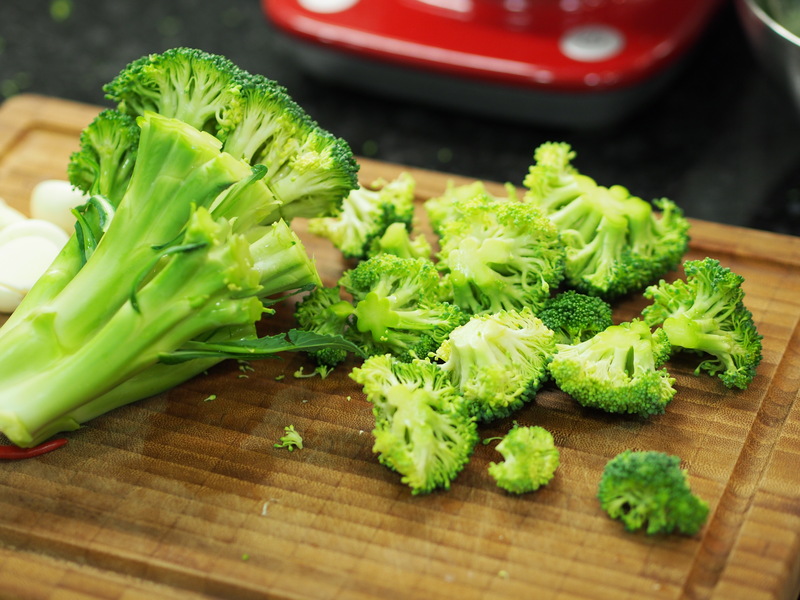 Have never thought of baking broc before but this looks great. Looks lovely, Crystal. 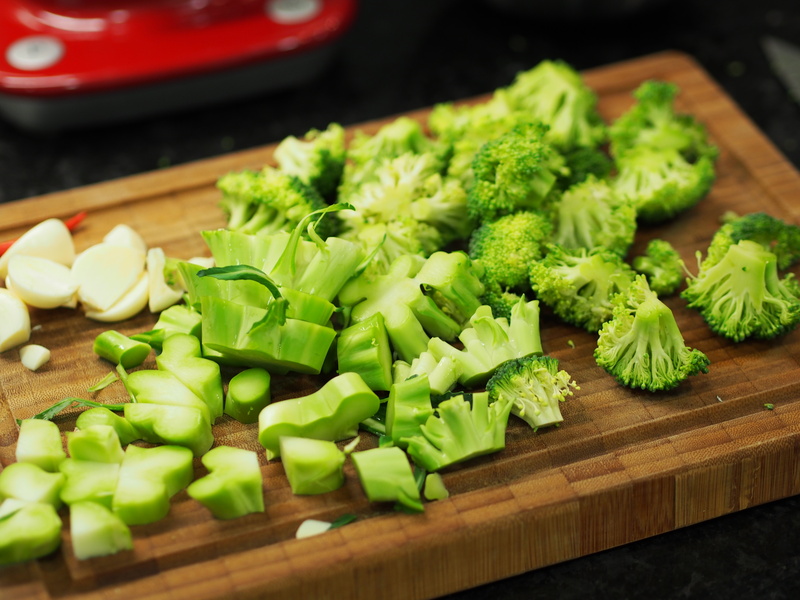 I love all things with broccoli and the different textures of creamy and crispy. Yum! This looks good, sounds good, and in my imagination tastes good. I will have to verify my imagination soon.